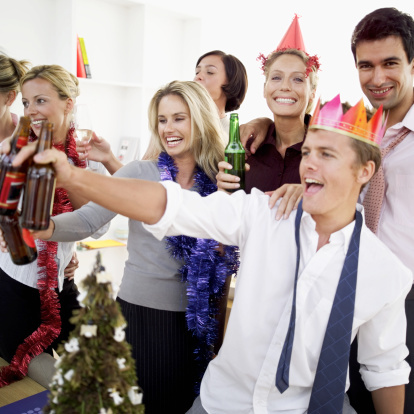 Company holiday parties are a way for employers to show their gratitude for all the hard work over the year. The opportunity to relax and celebrate is appreciated by the employees. Well, maybe not the accountants who have to sort through the expenses for the company party. The work of the accountants is certainly important, though, as a lot of company holiday expenses are deductible. Party planners just have to be mindful of what can and can’t be deducted. When going through expenses, here are examples of items that generally are and are not deductible. • Drinks for Aunt Jean, Uncle Larry, and Cousins Ron and Barbara. Spouses are normally covered, but extended family isn’t covered under an employee party. • Hiring Jay-Z to play your party: that’s considered extravagant entertainment. • Puppies as gifts for your employees: also likely considered an extravagant expense. • 100 percent of reasonable expenses can be deducted if it’s an all-employee party. • 50 percent of reasonable expenses can be deducted for entertaining clients, consultants, etc., provided the requisite business-relatedness test is met. • If employees also attend such a party, 100 percent of the cost of their attendance can be deducted. • Gifts to employees under $25 can be deducted, provided other gifts during the year don’t push you beyond the $25 limit per employee per year. Keep in mind that the tax deduction rules are quite complicated and that this post is a very basic overview of deduction rules for holiday parties. Speaking of rules, don’t forget that a great deal of documentation is required. Eric Sikola is General Manager and Founder of ExpenseCloud, a TriNet Company. He co-founded ExpenseCloud in 2008, building the company to 4000 customers and successfully selling the company in May 2012 to TriNet. Prior to ExpenseCloud, Mr. Sikola worked in the software industry for 15 years in various sales management positions at Forte Software, webMethods, Systinet (acquired by Mercury Interactive) and Aperture (acquired by Emerson Electronic). Mr. Sikola has a BS in Marketing from the University of Colorado and resides in Los Angeles with his wife and three children.